I am sure you have heard about different kinds of days: World Malaria Day, World Tobacco Day, World Mosquito Day and so on. 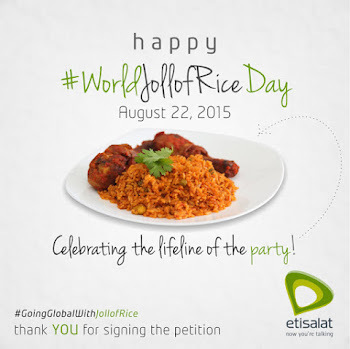 Well Etisalat have been championing declaring August 22 as World Jollof Rice Day. As a patron of a good food I have decided to support the mission. I am patiently waiting for my invite to future World Jollof Rice Day events which of course would include tasting and eating different types of jollof rice. You say I like food too much? Go away #Badbelle #Hehe.